Raindrops on snowdrops and warm swollen mittens, etc. etc. may have been some of Julie Andrews favourite things but rubbish and recycling, street litter and fly-tipping are some of West Hampstead’s least favourite. When the Neighbourhood Development Forum was drawing up its plans a few years ago, the issue of rubbish generally came up as having a significant impact on the quality of life for locals, but it falls outside the scope of the NDF as it is not strictly a planning issue. Then, as you all know, in April this year the council introduced a new rubbish and recycling collection contract with Veolia. Not surprisingly there were what the responsible councillor, Meric Apak, optimistically called ‘teething issues’. In reality there was a massive spike in complaints. True, these have subsided but there continues to be a constant stream of tweets and photos of fly-tipped waste in the area, and not all from Conservative activists out to make political capital from the issue. Against this backdrop, local amenity group WHAT held a meeting about rubbish and recycling earlier in the year before the contract was introduced. In July and August it followed up with a survey, mainly of their members (but also WHL readers) on how the new contract was working. It may not be the most representative slice of the local population, but nevertheless it still gives a sense of where we stand. 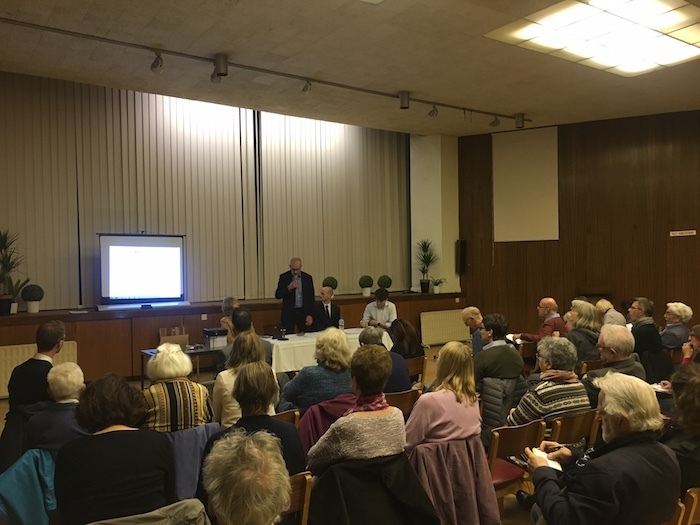 WHAT summarised the survey findings and held another public meeting last week to present the results to both Camden and Veolia. 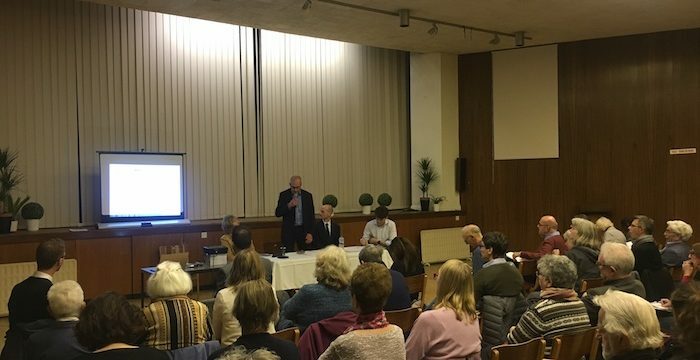 The meeting was pleasingly well attended – this is clearly still a hot local issue – though if everyone who vociferously complains on Twitter had turned up the room would barely have had capacity. Bins being left on streets is a problem, who puts them back? Why don’t the Veolia team report back problems? Richard Bradbury, who is responsible for the contract responded on behalf of Camden, backed up by Chris Burrows from Veolia. There has been a 10% improvement in recycling (by tonnage), but that only takes Camden from near the bottom of table to a bit below average. Richard reminded us that not all of Camden has switched to fortnightly collections as much of the south of the borough continues to get weekly collections. Camden pays £40/tonne less for recycled waste than for landfill; perhaps they should make more of this to encourage those who gripe about costs generally to do their part to reduce Camden’s spending here so it can be reallocated elsewhere. Chris from Veolia pointed out that they collect from 1,500 properties a day in the area, and now have on-board technology to start feeding back problem collections. He is already aware of many of these problems and the plan is to approach problem households in the Autumn. The early problems with getting the right bins to the right people seem to have largely been cleared up, and anecdotal evidence suggests that the online ordering system works fairly well. Garden waste collections can be shared but only from one address. Their systems can’t cope with changing addresses. This is for up to three bags per week. Richard agreed that engagement with estate agents was a good idea in order to pass on the most up-to-date information to new residents, especially tenants. There are already plans to contact landlords registered with Camden (though of course this is only a small fraction of them). Local litter hound Agnes pointed out that Camden did have control over Council owned properties and some leeway over Housing Association ones, which is where a large number of the problems are (as these properties are divided into flats). 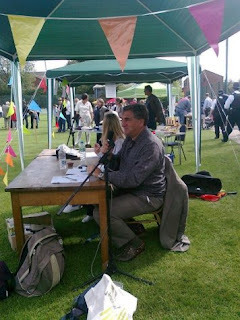 Richard Bradbury from Camden on the spot. As for West End Lane (and KHR, Fortune Green Road and Mill Lane) all of which have flats above shops, both the businesses and flats are supposed to have time-banded collections. This means rubbish should be left outside at very specific times and is collected much more frequently. It’s true that for some people those times are not practical, and thus the problem of dumped rubbish can seem worse than it really is. Generally on West End Lane the system works quite well – but there is little evidence of recycling on these streets (recognisable by the use of clear bags). Next came discussion on the vexing question of where people should leave bins on collection day, and where they should be returned. If the bins are within one metre of your gate, the original leaflets stated that ‘all containers will be returned to where you placed them for collection.’ However, this is not happening. Cllr Flick Rea cited an example of a neighbour who actually built a bin store for their two bins adjacent to the street and they are still not being returned. Indeed, some bins seem to be permanently left on the street. There is a property on Hillfield Road, which since April 1st has permanently left the bins on the street. Less than half the bin capacity is used so there is no need for any bins to be left on the street. Yet in six months of weekly recycling collection and fortnightly regular collection, plus weekly visits by the street sweepers no action had been taken. Next we heard from a woman who is not only a local resident but also a landlord of an HMO (House for Multiple Occupation as opposed to separate flats). She expressed extreme frustration at problems with collection saying there had been times when rubbish hadn’t been collected for weeks, and at being allocated bins that were too big for the space. The Clean Camden App for reporting fly-tipping was also mentioned. If you don’t use it already then it’s worth installing but although it deals with the issue it doesn’t tackle the underlying problem of flytipping in the first place. There are now six enforcement officers spread across the borough, who between tham have issued 50 fixed penalty notices in the past two weeks. 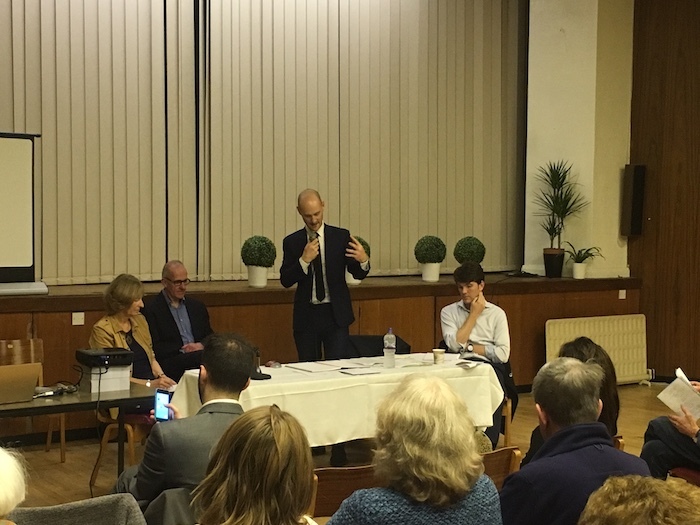 It seemed that both Camden and Veolia were surprised at the extent of the problems and the barrage of questions from what was a largely pro-recycling and mild-mannered audience. Local elections are six months away, and there were five sitting councillors in the room. If, somehow, they had yet to appreciate the scale of the problem they left the meeting in no doubt that there is much work still to be done before anyone can consider the new arrangement a true success. WHAT about the new recycling regime? Will fortnightly rubbish collection make us cleaner and greener?